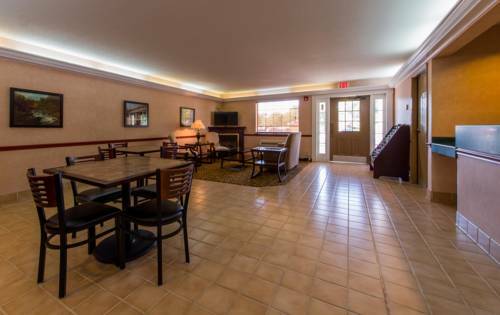 Country Hearth Inn Toccoa offers the most value for your money when staying for business- pleasure- or just passing through. We offer clean spacious rooms and suites- free coffee in the lobby- free continental breakfast- and free WiFi throughout the property. All guest rooms include mini-fridge- hairdryer- flat panel cable TV- HBO- ESPN- and alarm clock radio. Take advantage of our extremely comfortable beds and relax while saving money year-round with our Kids Stay Free Policy *11 and under in parent*s room*. For your convenience our hotel offers a smoke free environment. We are centrally located off GA-106 North and US-184- and are near local attractions such as Currahee Military Museum- Toccoa Falls College- and Camp Fire. Country Hearth Inn Toccoa is your best choice within the northeast region of Georgia. We offer ideal accommodations and location whether you are in town to visit the former training grounds of the World War II 101st Paratroopers at Camp Currahee- for shopping- sightseeing- or simply passing through on your way to Atlanta or Athens. At Country Hearth Inn Toccoa- Expect More. Get More. Country Hearth Inn Toccoa is located off GA-106 North and US-184. We are near local attractions such as Currahee Military Museum- Toccoa Falls College- and Camp Fire. Our address is 273 North Broad Street- Toccoa- GA- 30577.